In order to actually charge users, payment plans need to be setup for your directory. There are 2 types of payment plans that you can setup; Base and Add-on plans. Base plans define base features that should be enabled for listings associated with the plans. A listing may not have multiple base plans associated at the same time. Base plans can be purchased when users submit new listings, claim existing listings, renew their listings, or upgrade/downgrade their listings (correspond to 1-4 monetization options above). 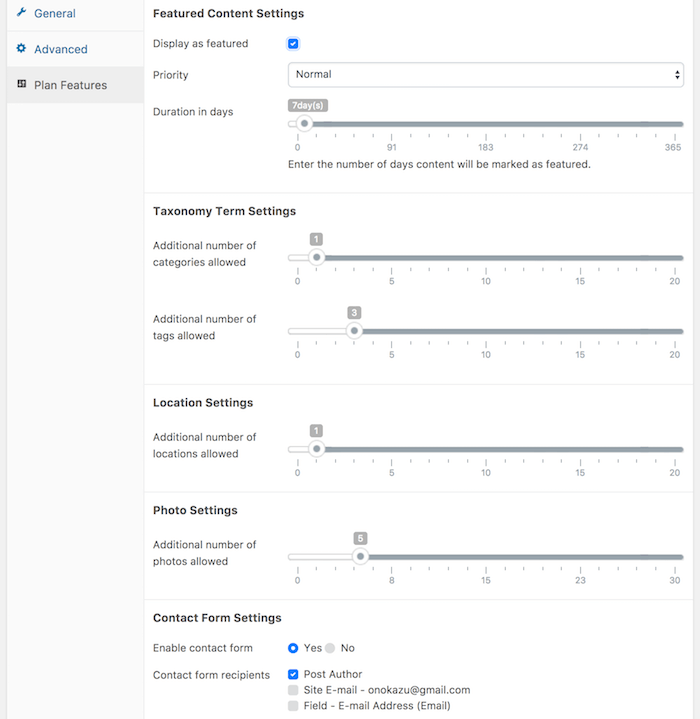 Add-on plans provide additional features to listings (corresponds to the 5th monetization option above) on top of the features provided with a base plan. A listing must already have a base plan associated in order to have add-on plans applied. There is no limit on how many add-on plans can be purchased for a single listing. Select Products -> Add New from the side menu. Enter the name of your payment plan into the text field where it says Product name which is a required field. Optionally enter the description of your payment plan into the textarea field under the product name field. Select the Directory - Listing (Base plan) product type option from the dropdown menu in the Product Data panel. In the General tab, enter the Regular price field and optionally the Sale Price field if you wish to sell the payment plan at a discounted price. In the Plan Features tab, configure the features that will be enabled for listings associated with this base plan. Duration in days - Set the length of time in days the payment plan is associated with listings. If you wish to use the prorated discount feature, you should define a limited duration. Allowed fields - Select the fields enabled for each listing. Max number of categories allowed - Select the maximum number of categories each listing can be associated with. Max number of tags allowed - Select the maximum number of tags each listing can be associated with. Max number of locations allowed - Select the maximum number of locations each listing can be associated with. 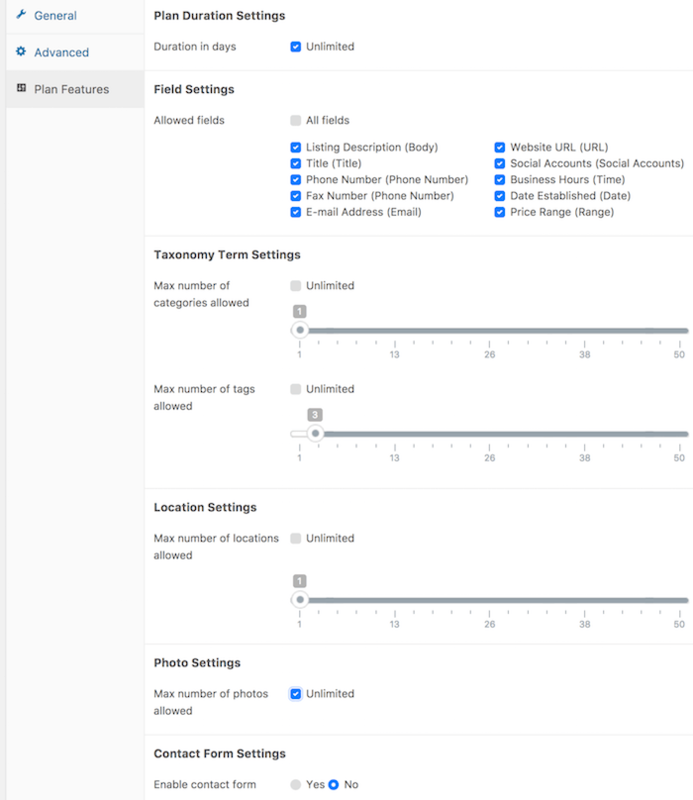 Max number of photos allowed - Select the maximum number of photos that can be uploaded for each listing. Enable contact form - Whether or not to let users send messages to listing authors through a Contact Us form. Contact form recipients - Select e-mail addresses to which messages are sent. If you have added E-mail type custom fields to listings (See Adding and Managing Fields), those fields can also be selected from here. Press Publish to add the base payment plan as a WooCommerce product. Follow the steps 1-3 for adding a Base plan described above. Select the Directory - Listing (Add-on plan) product type from the dropdown menu in the Product Data panel. In the Plan Features tab, select or enter additional features that should be applied to listings when this add-on plan is purchased. Most of the features available by default are similar to those available for Base plans. Below are some options available for add-on plans only. Display as featured - Whether or not to mark listings as featured. Featured listings can be displayed above other non-featured listings and/or highlighted to make them stand out or can be displayed separately for example using custom views. Priority - When multiple featured listings are displayed and sorted by featured listings first, those with higher priority are displayed above those with lower priorities. Duration in days - Enter the number of days listings will be marked as featured. Press Publish to add the add-on payment plan as a WooCommerce product. Under the Content Types tab, click the Edit button in the Listing row. Click Payment sub-tab under the Edit tab. 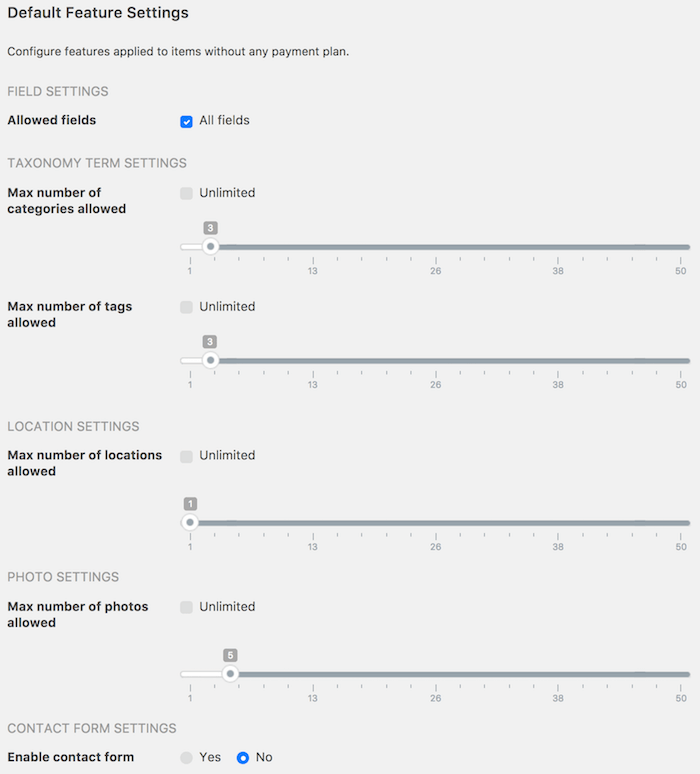 The features configurable in this section are exactly the same as those configurable for base payment plans (See Adding a Base plan above for details on each setting). Scroll further down the page and press Save Changes.